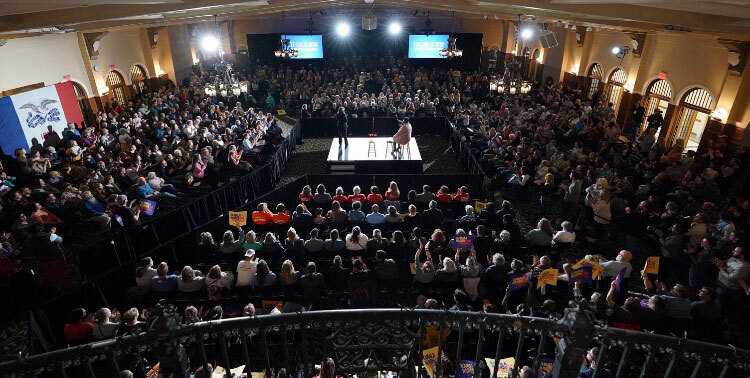 Photo from Kamala Harris campaign of Iowa City event. 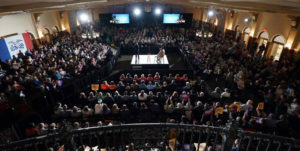 Democratic presidential candidate Kamala Harris touted her teacher pay proposal last night as she addressed about a thousand people at a town hall event in Iowa City. “One of the greatest expressions a society can make as an expression of love for its children is to invest in their education and, by extension, that means invest in our teachers,” Harris said. Harris is calling for a $315 billion federal investment in teacher salaries over a decade. Her campaign calculates Iowa teachers would see an average raise of $12,000. Harris told University of Iowa students in the audience last night that she hopes this encourages them to pursue teaching as a profession. According to the Harris campaign, the average teacher is paid about 11 percent less than others with similar college degrees. Harris’ plan would spend federal money to boost teacher pay by 10 percent, then call on states to provide money to match any additional federal investment in raises for teachers. Harris is campaigning in Des Moiens today. She’s appearing at a midday event hosted by “Emerge Iowa” — a group that encourages Democratic women to run for office. The chairwoman of the Iowa Democratic Party’s Women’s Caucus has endorsed Harris today and will be at the event. Jean Hessburg was executive director of the Iowa Democratic Party during the 2004 election cycle.